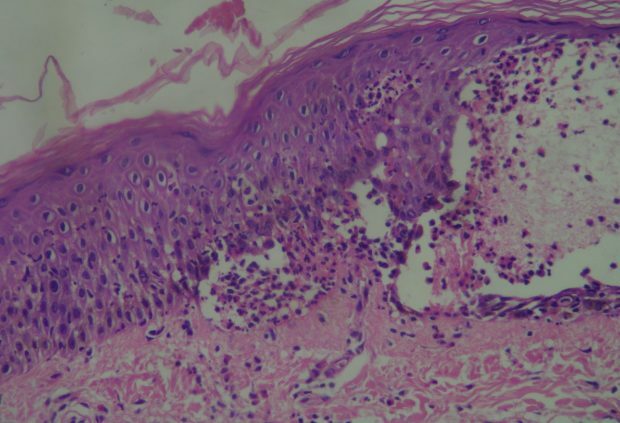 In this article, we give in details the facts, factors, pathogenesis, clinical picture, diagnosis, treatment of Pemphigus Vulgaris. A type of Autoimmune disease effecting the skin and oral mucousa. Its autoimmune disease involving skin, mucous membrane showing vesicles and bullae. Destruction of the intercellular cementseparation of the epithelial cell from each other (acantholysis). Formation of epithelial vesicle and bullae. Age: 40 – 60 years old. Suprabasial acantholysis near the tips of two adjacent rete pegs is recognized. Site: Skin and Mucous Membrane. Buccal mucosa, palate, gingival, lip. opposite to the occlusal plane. The oral lesion is before the skin lesion in 60% of cases, why? Because the oral lesion contains less intercellular cementing substance. Thin walled on a non‐ erythematous base. The bulla rapidly ruptures and breaks giving a shallow ulcer. 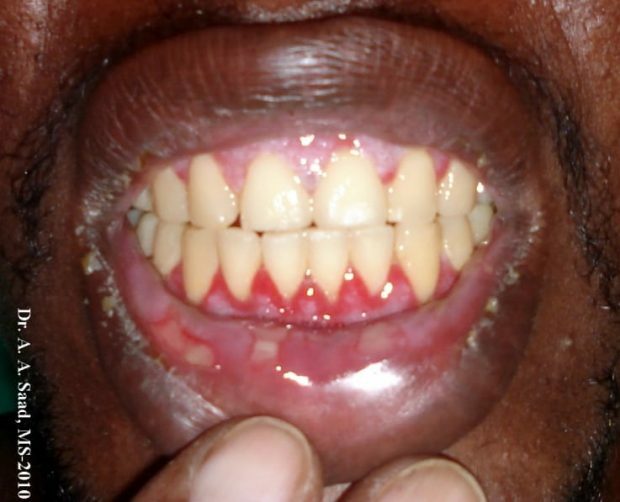 The ulcer is irregular with detached margins on the peripheral, why? The edges of the ulcer continue to extend peripherally thus increasing in size (extend to lip crust forming) + (extend to the throat leads to difficulty in swallowing) leading to detached epithelium at the margins and irregular margins. The ulcers are: Big, irregular, shallow and bleeding, why? Because the ulcers has epithelium detachments on the peripheral. Site: Groin, Axilla, face and neck. 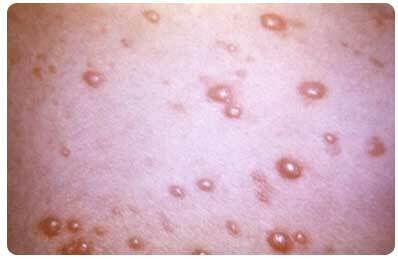 The Bullae/ Vesicle: Thin walled on a non erythematous Base, Shallow ulcers and contains clear or Hemorrhagic or seropuruelnt fluid. The bullae ruptures leading to ( ulcers + bleeding + easy detachment of epithelium on the periphery) thus the ulcers have an irregular margin. Why irregular margins of the ulcers? Because of easy detachment of epithelium on the periphery of the ulcer. Nikolsky’s sign is a clinical dermatological indicator, named after Pyotr Nikolsky. The sign is shows when slight rubbing of the epidermis results in exfoliation of the outermost layer forming a blister within instantly. 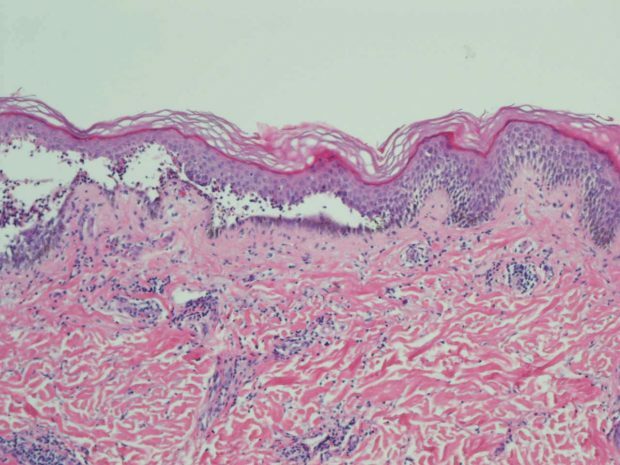 This sign is almost always present with toxic epidermal necrolysis and is associated with pemphigus vulgaris. 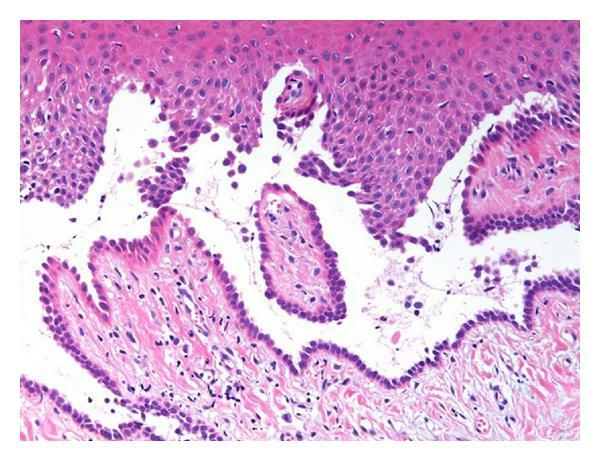 On intact oral mucosa: Lateral pressure may lead to peeling of epithelium leaving a large denuded area (Desquamated Gingivitis) or formation of vesicle or bullae. On vesicle: Vertical pressure extension of lesion to adjacent tissue increase in size of vesicle. Pressure on the Outer layer of epithelium is easily removed and slipped. Pressure on skin will lead to formation of bullae or vesicle. Pressure on an intact vesicle will lead to forcing the fluid to the surrounding unaffected tissue. Clinical Examination by a Postive Nikolsky’s Sign. Biopsy : Under microscope, Intra-epithelial Bullae is present. 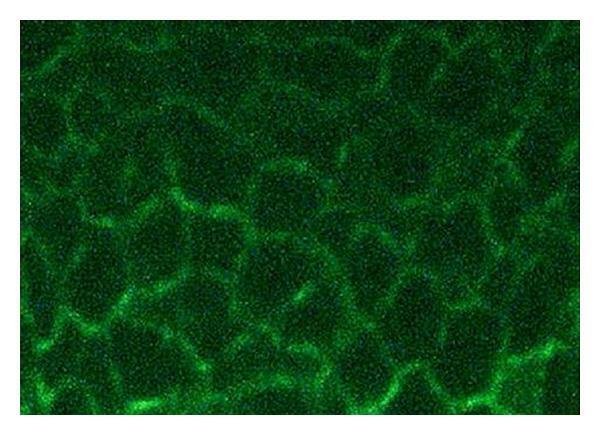 Immunofluorescence: to help detect the presence of IgG in the inter-cellular attachment zone. Direct Results: detects the tissue with the IgG autoantibody attached to them. Indirect Results: detects the presence of Autoantibody circulating in the blood. 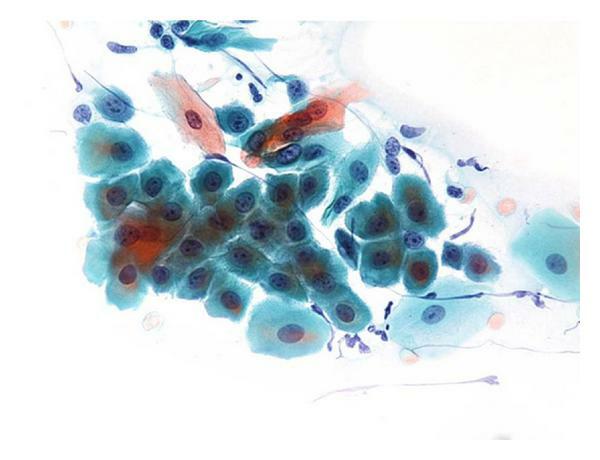 Cytologic Smear Showing T-Zank Cells. staining peripheral. They are found in the fluid of theBullae and its lining. Treatment is based on Steroids , pain management and good hygiene. Early diagnosis improves outcome of treatment, why? At later stage severe skin involvement will lead to secondary infection and severe imbalance of fluid electrolyte, this is considered fatal. In this state high dosage of corticosteroid is used to control the disease. The amount of corticosteroids used should be monitored, why? because risk of death due to high dosage of corticosteroids is riskier than the disease it self. Topical Drugs for the oral lesions include Topical Anaesthesia, Antiseptics and Corticosteroids. Systemic corticosteroids: Used alone or combined with immune‐suppressive drugs, why combined? To reduce the dosage, e.g. Azathioprine, Cyclosphosphamide. Misr International University By Dr. Mohsen S. Mohamed. The rest of article is viewable only to site members,Please Register and/ or Confirm registration via EmailHere. If you are an existing user, please login. A Dentist, Dental Manager at Healthway Medical Center, owner and author on OziDent.com. Graduated in 2009 with a Bachelor Degree in Dental Science from Misr International University. A veteran in digital dental content publishing and marketing. We are a Group of enthusiastic dentists and dental specialist who share a common goal of giving back to the public.